After thirteen years of presenting a standard online journal Pine Gate Mindfulness Community has taken it to a new blog format thanks to Br. Yves. This permits interaction and feedback on each item, enabling a discourse not possible before. It enhances the graphic/ photo content enormously and is in sync with the links and perks that online offers. 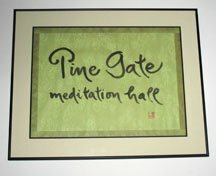 Pine Gate is a Zen Buddhist community practicing Engaged Buddhism inspired by Thich Nhat Hanh, the Dalai Lama and Sulak Sivaraksa. It has created an engaged expression for peace, social justice and planetary care as the community is the nucleus of Friends for Peace. The coalition, with Pine Gate at the core, has since created annual events to celebrate peace, social justice and planetary care. The resident teacher is Dharmacharya Ian Prattis – True Body of Wisdom. Ian is a poet, scholar, peace and environmental activist. As a professor at Carleton University he taught courses on Ecology, Symbols, Globalization and Consciousness – reflected in his 2008 book: Failsafe: Saving The Earth From Ourselves. As an ordained meditation teacher he encourages people to find their true nature so that humanity and the world may be renewed. He has trained with masters in Buddhist, Vedic and Shamanic traditions. Pine Gate, located in the west end of Ottawa, had very modest beginnings. 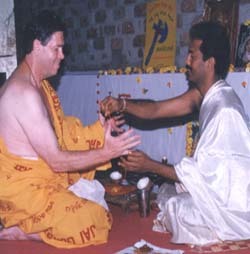 Inaugurated in 1997 following Ian’s return from teaching meditation in India, early gatherings featured Ian, his wife Carolyn, and their pets – Nikki the dog and Lady the cat. Since then it has blossomed into a very vibrant community. 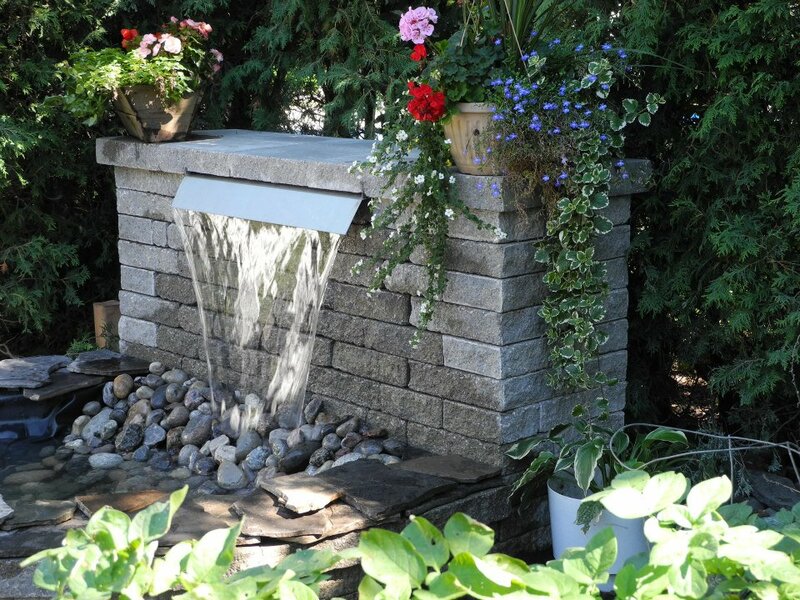 In the summer of 2001 major renovations took place to the lower level of Ian and Carolyn’s home. A new meditation hall emerged from the dust and knocked down walls – the Pine Gate Meditation Hall – named after Thich Nhat Hanh’s story in the book: The Stone Boy and Other Stories. Zen Master Thich Nhat Hanh provided a gift of calligraphy, naming The Pine Gate Meditation Hall. This now hangs on the wall for all to see. The new meditation hall has become a source of sanctuary for many friends. There are three seasons at Pine Gate – the Fall Study Session from September to December, the Winter Study Session from January to May, and the Lazy Days of Summer program from July to August. June is recess and quiet time. There are regular meetings for meditation and study every Thursday evening from 7.00pm – 9.00pm. Duong Sinh – Bamboo Stick Qi-gong classes, known as the Life Sustaining Way of the Heart, are offered in addition to regular qi-gong classes throughout the year. Potluck vegetarian suppers, Hikes, Sweat Lodges, Pilgrimages, Days of Mindfulness, and Meditation Retreats are organized on a regular basis. The voice of the sangha can be heard through its Quarterly Buddhist Journal – Pine Gate – which appears three times a year. Quirky!. 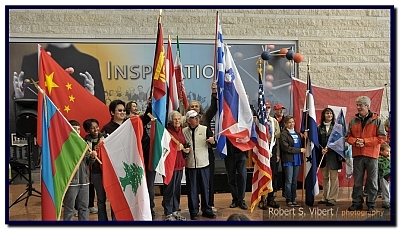 Koozma Tarasoff wrote this article as part of his report on the two week Peace Festival that preceded the Friends for Peace Day. He received a Peace Award in 2012 for his long term activism for peace issues. 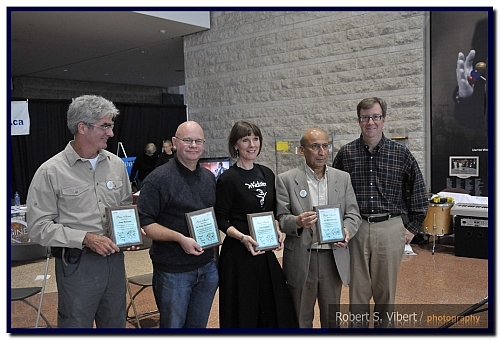 The 11th Anniversary of Friends of Peace under the leadership of Ian Prattis and his team from Pine Gate Mindfulness Community, was an outstanding event. 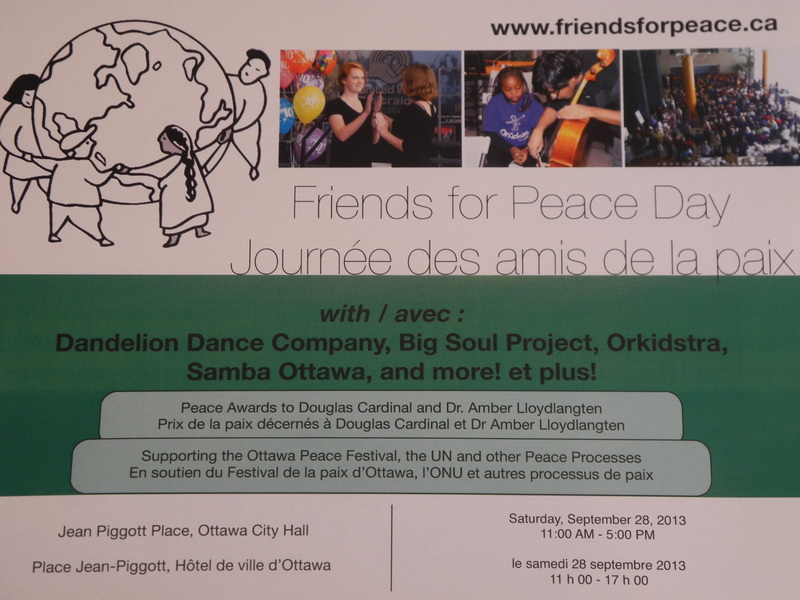 With a coalition of 50 organizations in the Ottawa area, Friends of Peace has been an integral part of the Annual Ottawa Peace Festivals. There were peace and environment booths along the periphery of the hall, a food court at the back, a long set of tables on which were items for the Silent Auction, and the stage at the north end. Mony Dojeiji and Alberto Agraso had a booth publicizing their European-Asian Walking for Peace: An Inner Journey, about their 5000-kilometer, 13-country, 13-month walk for peace from Rome to Jerusalem in 2001. The OrKidstra Kidplayers, in the photo above under the direction of Tina Fedeski, and Kidsingers directed by Margaret Tobolowska, Jeannie Hunter, and Jennifer Martinez, were excellent. 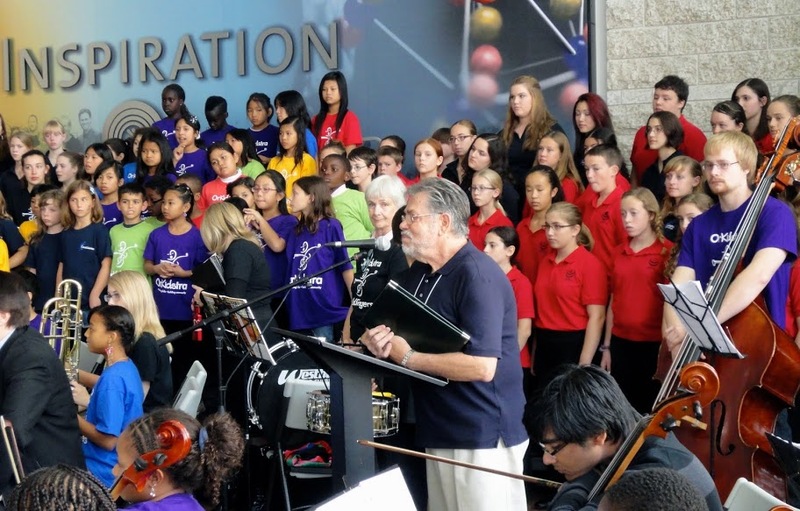 Among the songs in the half-hour presentation was ‘Ode to Joy’, with some 35 instrumentalists and 20 young children. Dandelion Dance Company, directed by Hannah Beach, brought forth some 11 young lady actors, dressed in black, up to the age of 18. With their passion for nonviolence and the basic rights for people, the Company presented four themes designed to build a better peaceful world: (1) We have a right not to be bullied and harassed; (2) We have a right not to be hungry; (3) We need to deal sensibly with a ‘cash, credit, and debit’ society; and (4) A poem on our hope and dreams that we want for our society. 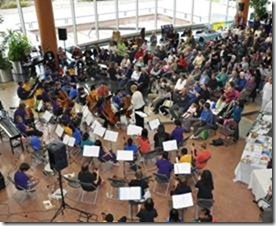 The Big Soul Project (some 50 people as singers and a 4-piece band), headed by Roxanne Goodman, Music Director, has appeared at the Friends for Peace every year, on this day for the 11th time. They were excellent in fulfilling such numbers as ‘What are we going to leave behind when we leave?’ Its message: ‘Now is the time, will you be able to say I was here?’ ‘When I leave this world, will I make a mark that I was here?’ The implication is that what we do today will affect the quality of life tomorrow. Ian Prattis presented the annual Peace Awards. The first went to Douglas Cardinal, ‘a visionary world master’ who was the architect for the Canadian Museum of Civilization. Born to a German – Native family, Cardinal said that all of Nature including human beings are interconnected. ‘Life springs through every being and rock in this life. This is a symbiotic relationship of life and nature. Each person has divine creation in them….Each person is a God….We are Gods on this land. That is our legacy. We have the capacity to create as well as destroy….Elders trained me to honour culture as the peacemaker. 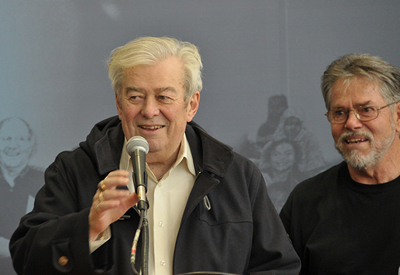 We come from a society where everyone is noble, unique and responsible.’ Ian Prattis then turned to the second recipient of the 2013 Peace Awards. This was to Amber Lloydlangston, historian at the Canadian War Museum and the key person who developed the Peace Exhibit there. Ian praised Amber for her excellence in producing such a unique exhibit, beginning with the Aboriginal Six Nations story. The exhibit officially ends in January 2014. Ian remarked: ‘Let’s help to make this a permanent exhibit, so that peace remains as an integral part of the war museum.’ After receiving her Award, Amber Lloydlangston said that she was humbled in being present with such a candidate as the renowned Douglas Cardinal. In the Peace Exhibit, she said that she and her colleagues wanted to show to Canadians what peace means in the form of diplomats, soldiers, peacekeepers and humanitarians. Lucille Hildesheim’s performance on the Celtic Harp was outstanding. The closing Friends of Peace Band from Montreal, led by Sonja Ball and friends, was very lively, with a focus on how lucky we are to be alive. ‘This is about being happy and our right to be happy.’ That was certainly the feeling at the end of this magnificent day. The diversity of citizens who came to the Friends for Peace Day laughed, danced, cried and went home with confidence and solidarity. Peace, Planetary Care and Social Justice are alive and well in our northern city. A Circle of Nations no less. 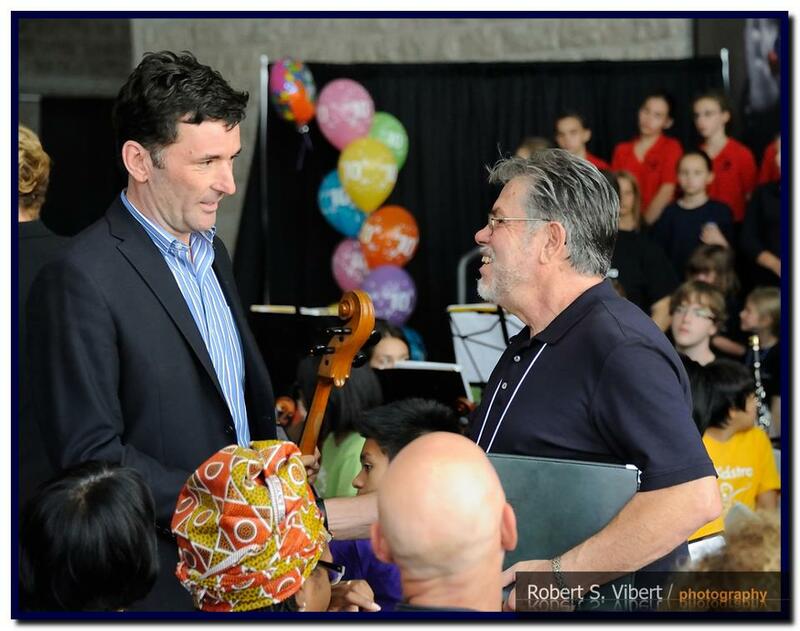 “I want to talk to you about our children and the kind of future we create for them. Do we teach them peace? Or through neglect do we allow violence to flood their minds, hearts and consciousness so they learn war? Even worse, do they live out our own personal wars expressed through our violent attitudes, speech and actions towards them? I ask every adult here, particularly men, and in our country to deal with their internal wars so that only the best in us is passed on to our children, not the worst in terms of violence. How do we deal with our internal wars, hatreds and fears that constitute our Wild Mind? We must stop running; stop hiding behind our addictions and busyness. We come to a stop, look deeply into the eyes of our children and make a commitment to face our internal demons and transform them by stepping on to the path of compassion. Not by transmitting our wars and internal afflictions to the children of the world. We need community for this, to support us in sacred ceremony, meditation and creative spirituality so that we raise our consciousness by retraining our minds, through refining our speech, attitudes and actions. We show our children the way to peace by learning to be it. Since 9/11 the level of hate and violence globally has increased dramatically. Excessive violence has been used to suppress violence. This is not the way to proceed. There is no “them” and “us.” We either learn to live peacefully together or we all suffer and die together. All violence is injustice and we have to teach our children the truth about war. Not about winners and losers, but about the long term suffering on both sides. 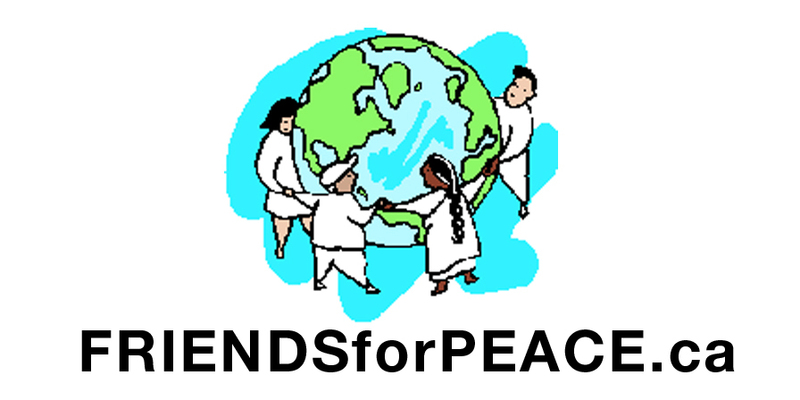 It is only citizens of the world standing together for peace and saying “No to War” that will stop it. But the hatred grows and the suffering increases. What can we do as individuals to change this? We go to war – with ourselves. First of all we must uproot the violence and war within our minds. To prevent war we nurture non-violence. We practice meditation and prayer in daily life to transform the poisons within our minds and within our nation. We enter into true peace negotiations by learning the methods of deep listening, of respectful and non-violent communication. By understanding and bringing our mindless, selfish agendas to a stop. We create peace by knowing that compassion is the antidote to violence and hatred. We must also make peace with Mother Earth. If we injure Mother Earth, we injure ourselves. Our civilization has caused such deep harm to the earth that we humans may soon become an endangered species. We have imposed so much neglect and ignorance upon the Earth. The solution is not political or economic – these are secondary. The primary solution is spiritual. Every faith and spiritual tradition must renew its ethics and responsibilities and honour the interconnected nature of humanity with Mother Earth. We must make it clear to our political and corporate leaders that the violence they commit in our name is no longer acceptable. We must hold them to account and influence them with our clarity, wisdom and courage. The actions we take now are shaping the possibilities for future generations. So here is our challenge. Today, in the pouring rain and thunder storms we have experienced peace, a deep peace shared between many traditions, cultures and religions. This experience evaporates into nothing if we do not translate it into action. Begin the work on yourselves today, so that your attitudes, speech and actions become an example to your children, friends and communities. Take the practical steps to make peace with Mother Earth in terms of what you consume and support. Then represent your community, in coalition with other communities, to political and corporate leaders. Show clearly that we are choosing peace and harmony within ourselves, within our communities and with Mother Earth. Together we can do it. There will be music, speeches, dancing, fabulous food at the Servery, and a chance to learn and connect. The day opens with Orkidstra followed by the Dandelion Dance Company. These young people signal that we have a future. Peggy Taillon will talk about the Hera Mission in Kenya. And all-time favorites, Big Soul Project, close the morning program by raising the roof with their exuberance and joie. The Lunch Break is an opportunity to browse the Silent Auction, visit the community tables, check out the Connection Centre and enjoy the country bazaar nature of the event. The afternoon program begins with a First Nations theme – Asinabika Drum Circle and Idle No More. 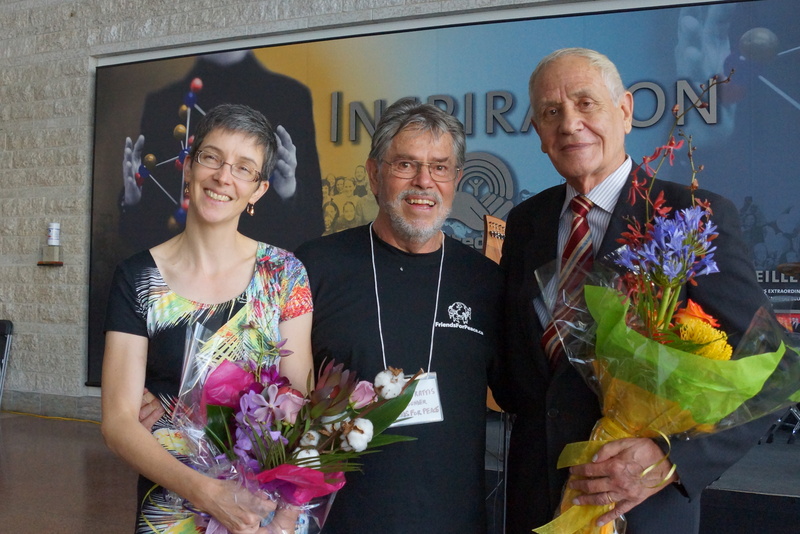 The 2013 Peace Awards will be presented to architect and visionary Douglas Cardinal and to curator Dr Amber Lloydlangten and her team at the War Museum for their magnificent Peace Exhibition. From Montreal – a great band with Sonja Ball and Friends, followed by Lucille Hildesheim on Celtic Harp. Samba Ottawa close the day with their rhythmic magic.